Listen to this Post Wood, soil, shells and succulent plants. Many succulents come from the dry areas of the tropics and subtropics. 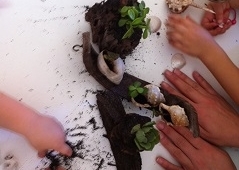 The children enjoy the contrasting textures and colours of these fleshy, water-storing plants which we are growing inside pieces of wood and seashells.